Join Dave Stotts on his biggest adventure yet! He travels the Mediterranean region to share the people, places, and events that launched the Christian faith – using the book of Acts as a roadmap. 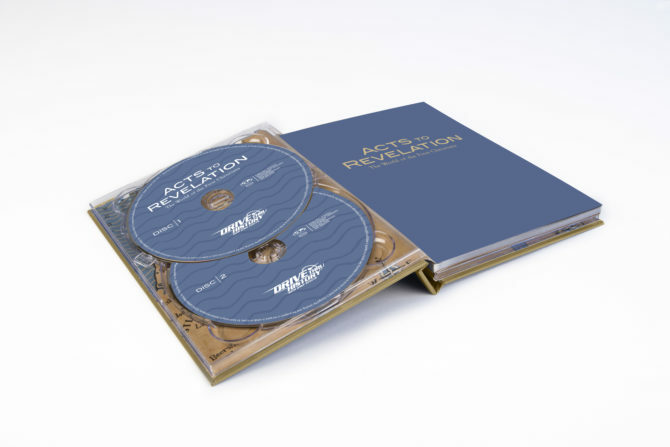 18 Episodes, 3 disks, 495 total minutes. Includes full-color study guide. Over 18 episodes, Dave investigates what happened after the Gospel accounts of Jesus Christ. He follows the lives of Peter, James, Philip, and Stephen through Israel. He travels the missionary routes of Paul, Barnabas, Silas, and Timothy through Turkey, Cyprus, Greece, Malta, and Rome. 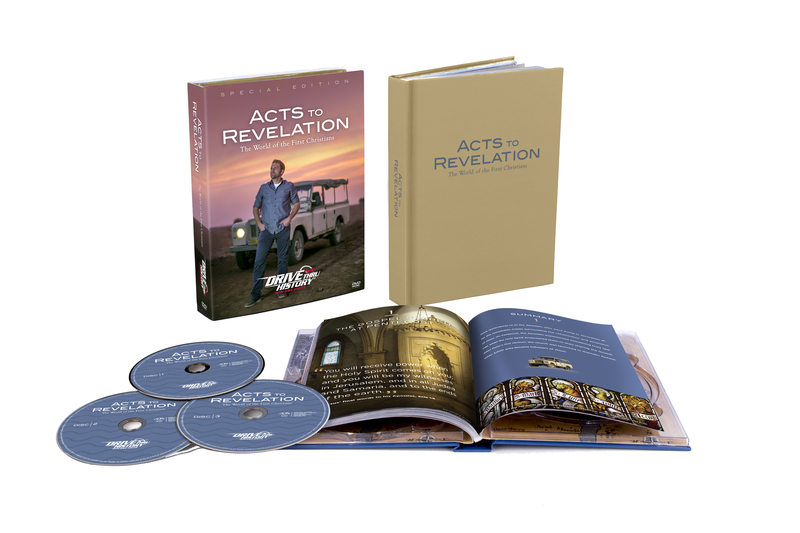 He finishes with John on the island of Patmos and drives through the seven churches of Revelation in Asia Minor. 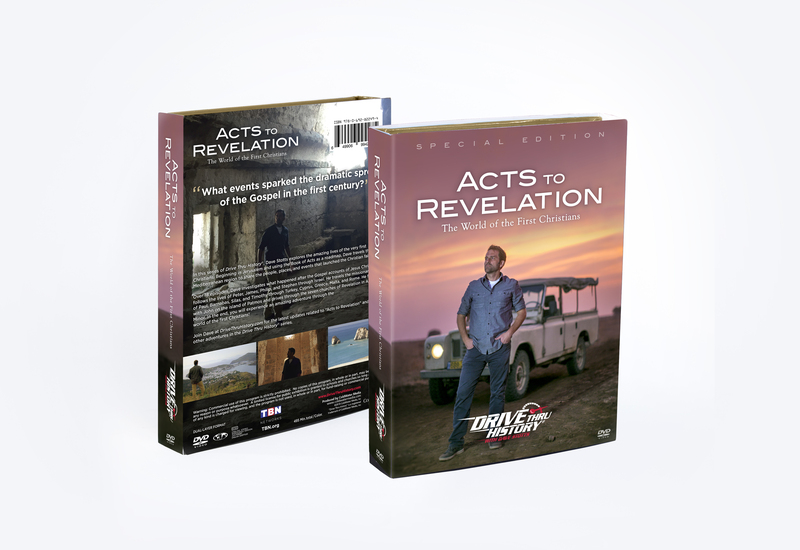 In the end, you will experience an amazing adventure through the world of the first Christians! Like you’ve come to expect from Drive Thru History®, these shows are fun, adventurous, and family-friendly. 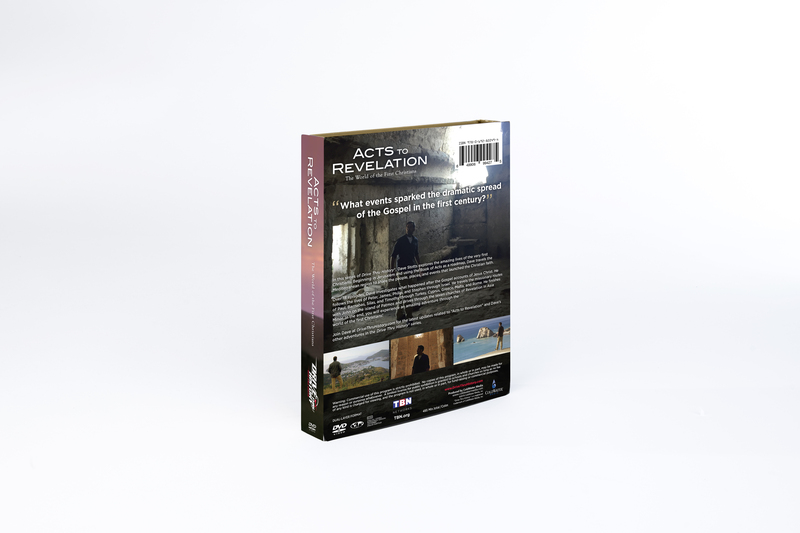 This special edition release of Acts to Revelation includes nearly nine hours of video adventures, in addition to a full-color study guide – which takes you through each episode and provides extra content, questions, and readings. The included 124-page booklet acts as an excellent curriculum supplement for homeschool families, private schools, churches, and small groups. 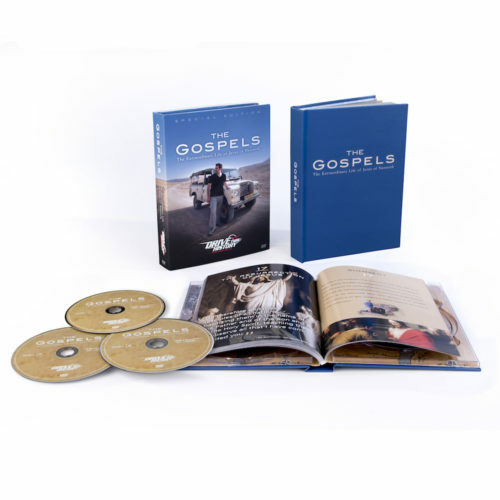 Together with “The Gospels” series, you will find no better way to take your family on a road trip through the entire New Testament! Watched episodes on TBN and my husband suggested “sending the guy an offering” due to biblical accuracy and overall quality. Excellent program! Easy to follow, wonderful to listen to and a joy to watch. 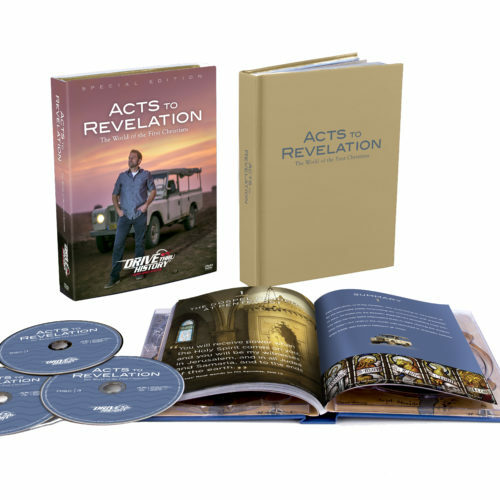 I have just started following David’s page of teaching and I have to say; he makes you feel like your right there in the midst of the teaching..
We absolutely love this series! We’ve read the New Testament so many times but never seen it presented this way. To understand it better through a historical context is so helpful and sometimes so necessary when it comes to certain passages! 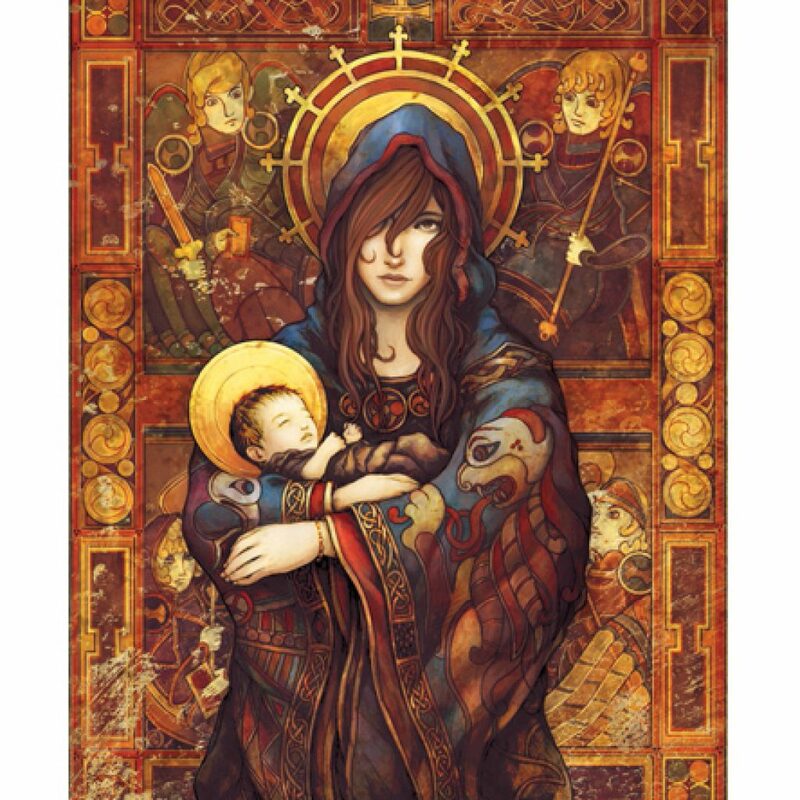 I would love to see something like this for the Old Testament. Absolutely fabulous series, so well done from the commentary, visuals, and of course a great entertaining and knowledgeable host. 5+ stars!! !